Although not updated since 2010, the most detailed English website about cannabis in Japan is at taima.org accessible here. “Most Japanese people see cannabis as a subculture of Japan but they’re wrong. For thousands of years cannabis has been at the very heart of Japanese culture,” explains Junichi Takayasu, one of the country’s leading experts. According to Takayasu, the earliest traces of cannabis in Japan are seeds and woven fibers discovered in the west of the country dating back to the Jomon Period (10,000 BC – 300 BC). Archaeologists suggest that cannabis fibers were used for clothes – as well as for bow strings and fishing lines. These plants were likely cannabis sativa – prized for its strong fibers – a thesis supported by a Japanese prehistoric cave painting which appears to show a tall spindly plant with cannabis’s tell-tale leaves. “Cannabis was the most important substance for prehistoric people in Japan. But today many Japanese people have a very negative image of the plant,” says Takayasu. The museum is located in a log cabin 100 miles from Tokyo in Tochigi Prefecture – an area long-associated with Japanese cannabis farming. The prefecture borders the Tohoku region which was devastated by the March 11 2011 earthquake – but being inland from the tsunami and shielded by mountains from radioactive fall-out, it largely escaped the effects of the disaster. The museum is packed with testimony to Japan’s proud cannabis heritage. There are 17th century woodblock prints of women spinning fibers and photos of farmers cutting plants. In one corner sits a working loom where Takayasu demonstrates the art of weaving. He points to a bail of cannabis cloth – warm in winter, cool in summer, it’s perfectly suited to Japan’s extreme climate. Playing such a key role in agriculture, cannabis often appeared in popular culture. It is mentioned in the 8th century Manyoshu – Japan’s oldest collection of poems and features in many haiku and tanka poems. Ninjas purportedly used cannabis in their training – leaping daily over the fast-growing plants to hone their acrobatic skills. According to Takayasu, cannabis was so renowned for growing tall and strong that there was a Japanese proverb related to positive peer pressure which stated that even gnarly weeds would straighten if grown among cannabis plants. In a similar way, school songs in cannabis growing communities often exhorted pupils to grow as straight and tall as cannabis plants. Due to these perceived qualities, a fabric design called Asa-no-ha based upon interlocking cannabis leaves became popular in the 18th century. The design was a favorite choice for children’s clothes and also became fashionable among merchants hoping for a boom in their economic fortunes. Early 20th century American historian, George Foot Moore, also recorded how Japanese travelers used to present small offerings of cannabis leaves at roadside shrines to ensure safe journeys. Families, too, burned bunches of cannabis in their doorways to welcome back the spirits of the dead during the summer obon festival. Given this plethora of evidence that cannabis was essential in so many aspects of Japanese life, one question remains in doubt: Was it smoked? Takayasu isn’t sure – and nor are many other experts. Historical archives make no mention of cannabis smoking in Japan but these records tends to focus primarily on the lifestyles of the elite and ignore the habits of the majority of the population. For hundreds of years, Japanese society used to be stratified into a strict class system. Within this hierarchy, rice – and the sake wine brewed from it – was controlled by the rich so cannabis may well have been the drug of choice for the masses. Until the early 20th century, cannabis-based cures were available from Japanese drug stores. Long an ingredient in traditional Chinese medicine, they were taken to relieve muscle aches, pain and insomnia. The prohibition against the Japanese cannabis industry also has a foreign origin. According to Takayasu, the 1940s started well for cannabis farmers as the nation’s military leaders – like those in the U.S. – urged farmers to plant cannabis to help win World War Two. “The Imperial navy needed it for ropes and the air force for parachute cords. The military categorized cannabis as a war material and they created patriotic war slogans about it. There was even a saying that without cannabis, the war couldn’t be waged,” says Takayasu. However after Japan’s surrender in 1945, U.S. authorities occupied the country and they introduced American attitudes towards cannabis. Having effectively prohibited its cultivation in the States in 1937, Washington now sought to ban it in Japan. With the nation still under U.S. control, it passed the 1948 Cannabis Control Act. The law criminalized possession and unlicensed cultivation – and more than 60 years later, it remains at the core of Japan’s current anti-cannabis policy. At the time, the U.S. authorities appear to have passed off the Act as an altruistic desire to protect Japanese people from the evils of drugs. But critics point out that occupation authorities allowed the sale of over-the-counter amphetamines to continue until 1951. Instead, several Japanese experts contend that the ban was instigated by U.S. petrochemical lobbyists who wanted to overturn the Japanese cannabis fiber industry and open the market to American-made artificial materials, including nylon. 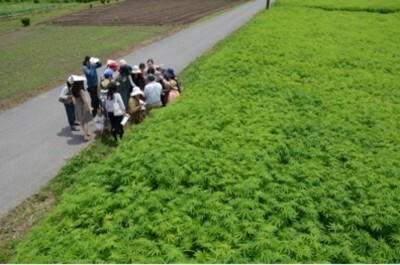 Workers harvest cannabis at a licensed farm in Tochigi Prefecture. (Photo by Junichi Takayasu). Takayasu sees the ban in a different light, situating it within the wider context of U.S. attempts to reduce the power of Japanese militarists who had dragged Asia into war. Regardless of the true reasons, the impact of the 1948 Cannabis Control Act was devastating. From a peak of more than 25,000 cannabis farms in 1948, the numbers quickly plummeted – forcing farmers out of business and driving the knowledge of cannabis cultivation to the brink of extinction. Today there are fewer than 60 licensed cannabis farms in Japan – all required to grow strains of cannabis containing minimal levels of THC – and only one survivor versed in the full cannabis cycle of seed-to-loom – an 84 year-old woman. Simultaneously, a sustained propaganda campaign has cleaved the Japanese public from their cannabis cultural roots – brainwashing them into perceiving marijuana as a poison on a par with heroin or crack cocaine. Every year, the Japanese police wage well-publicized eradication campaigns against these plants. On average, they discover and destroy between one and two million of them. But like so many other aspects of the drug war, theirs is a losing battle and the next year, the plants grow back in larger numbers than ever. Due to the taboos surrounding discussions of cannabis, many people had been reluctant to condemn these police campaigns. But now critics are beginning to attack both the waste of public resources and the needless destruction of such versatile plants. Nagayoshi Hideo, author of the 2009 book, _Taima Nyuumon – An Introduction to Cannabisargues for the wild cannabis plants to be systematically harvested and put to use as medicines, biomass energy and in the construction industries. Yukio Funai – another advocate and author of Akuhou! Taima Torishimarihou no Shinjitsu – Bad Law! The Truth Behind the Cannabis Control Act (2012) – calls cannabis a golden egg for Japan. In a detailed breakdown of the potential economic benefits of legalization, he factors in savings from reduced policing and incarceration – concluding the country could reap as much as 300 billion dollars in the long term. In a nation facing unprecedented economic problems, it appears these arguments are striking a chord. Recently Japan slipped behind China as the world’s third economic power and the country owes more than ten trillion dollars in debt – double its GDP. These problems contribute to the human toll of an estimated 6.5 million alcoholics and a suicide rate that hovers at around 30,000 a year. The legalization of cannabis could solve some of these problems. By luring young entrepreneurs back to the land, it could counter agricultural decline – particularly in post-earthquake Tohoku. It might improve the quality of care for thousands of cancer patients and halt the brain drain of scientists forced overseas to research medical cannabis. Legalization would also prevent the annual arrests of 2000 Japanese people – many in their 20s and 30s – whose lives are destroyed by their nation’s illogical and ahistorical laws. In years to come, Taima Hakubutsukan might be seen as a true beachhead in this struggle. Botanists usually divide the cannabis family into three broad categories – tall cannabis sativa, bushy cannabis indica and small cannabis ruderalis. However this simple taxonomy is often frustrated by the interfertility of these three types which allows them to be crossbred into limitless new varieties. Marijuana, for example, usually refers to cannabis plants which are grown to be ingested for medical or recreational uses. Cannabis sativa is said to give users a feeling of energetic euphoria and can be prescribed for depression, whereas cannabis indica is apparently more sedating so can be used as a muscle relaxant or to treat chronic pain. Hemp, is the name often applied to tall plants from the cannabis sativa category which are primarily grown for their strong fibres – but may also contain significant levels of THC. Most recently, the term industrial hemp has been coined in the U.S. to refer to cannabis plants which have been specially-bred to contain very low levels of THC (less than 1%) in order to conform to current drug laws. Today, many of Japan’s licensed cannabis farms grow a low-THC strain called Tochigi shiro which was first developed in the post-War period. Two of the best Japanese texts for information about the nation’s cannabis history are Nagayoshi Hideo, Taima Nyuumon (An Introduction to Cannabis), Gentosha, 2009 and Yukio Funai, Akuhou! Taima Torishimarihou no Shinjitsu (Bad Law! The Truth Behind the Cannabis Control Act), Business Sha, 2012. For more information on the museum, see here . For a Japanese interview with Takayasu about the origins of the museum, see here. For more details about the religious role of cannabis in Japan, see here. For the text of the UN report, see here; for the THC levels in the 1970s, see for example here. CBC News, “Japan stuffs magic mushroom loophole”, May 14 2002. Available here.